Drunken Kung Fu or Drunken Boxing refers to the group of kung fu styles where you behave erratically like a drunk to deceive, distract and attack the opponent. Other kung fu styles such as Choy Li Fut, Praying Mantis and Monkey Kung Fu have some form of drunken boxing form in them, but Jackie Chan has popularized the classic drunken boxing style, the Eight Drunk Immortals Form above all others in his movies. Although it appears erratic and uncertain, the always shuffling footwork in the Eight Drunk Immortals Form is extremely well thought out - Because your center of gravity is constantly shifting, you could deflect or evade any hit that could not be blocked easily. A moving target is harder to hit than a static one. Further, the more the opponent is preoccupied trying to figure you out, the less time he has in his mind to think about a plan of attack. In addition to evading, you can use the dynamic footwork to mask your dominant foot for combination kicking. By being constantly in motion, you can easily launch strikes without broadcasting your intent to your opponent, since your entire body is moving already. In Drunken Boxing you use the power technique known as Zian Shi Gin to cause damage. This is a type of piraling/drilling energy that comes from turning your body into any hit. The Lu Don Bin Form is named after the Taoist God Lu Don Bin (see below), and is the first form of Eight Drunken Immortals. 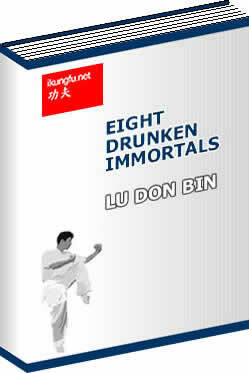 In the Lu Don Bin Form, you are introduced to the basics of Eight Drunken Immortals style Drunken Kung Fu, such as swaying back and forth continuously to trick the enemy to think that you lack focus, and cause your enemy to let his or her guard down. You are also introduced to the unique and versatile Hulao Guard or Claw technique. Our eBook covers the concepts of Eight Drunken Immortals style Drunken Kung Fu before moving to cover the movements of the Lu Don Bin Form and its underlying concepts and applications. Who is Lu Don Bin? Venerated as a Taoist God, Lu lived at the time of the Tang Dynasty (705-800AD), from Shanxi Province. Legend has it that he had tried to become a government official, but failed the qualification exams. He fell into a long sleep thereafter and woke up 18 years later only to find that all his family members had passed away. He remained a disappointed man for most of his life. However, at old age he met Han Zhong Li (another member of the Eight Immortals), who introduced him to the way of the Tao. Finally finding the meaning of life, Lu took to Taoism greatly and founded a Taoist sect. This became the biggest de-facto Taoist sect in China, and he therefore is also known as Lu Zu (Lu, The Ancestor of Tao). Despite his stature, he remained close to the people and traveled far and wide around China to perform Taoist blessings and exorcisms. Today, Lu is the most well known and loved of the Eight Immortals, and is the leader of the group. The Chinese commemorate him on his birthday, the 14th day of the fourth lunar month and pay homage to him as the patron deity of barbers and hair dressers. In pictures, Lu Don Bin is presented as a youthful scholarly man. He carried with him a Hu Lao, a wine gourd and wears a Taoist Hat. He carries with him a mystical dragon sword that grants him the power of invisibility and allows him to dispel evil. You will find set out in our Lu Don Bin eBook the complete traditional Lu Don Bin Form, packed with over 67 carefully created diagrams to show you the entire form in addition to the many illustrations in the main body of the eBook.